Does My Child Need a Mouthguard for Sports? A six-year-old missing their two front teeth can be quite the cause for celebration. Just think of all the tooth fairy visits and all relatives marveling at the new, hip look. Now if it’s a teenager without those teeth, well that’s a different story with much less celebration. And such tooth loss happens all the time - particularly if your child participates in sports. In fact, the American Dental Association suggests that athletes are 60 times more likely to experience harm to their teeth if they're not wearing a properly fitting mouthguard. If your child is active in sports - even the backyard variety – please consider investing in one. The American Dental Association estimates that “a full third of all dental injuries are sports related … and that the use of a mouthguard can prevent more than 200,000 oral injuries to the mouth each year”. The risks of playing sports without protection aren’t just related to teeth loss: a harsh impact to the jaw can even affect the growth of facial features or cause a concussion that could have otherwise been avoided. 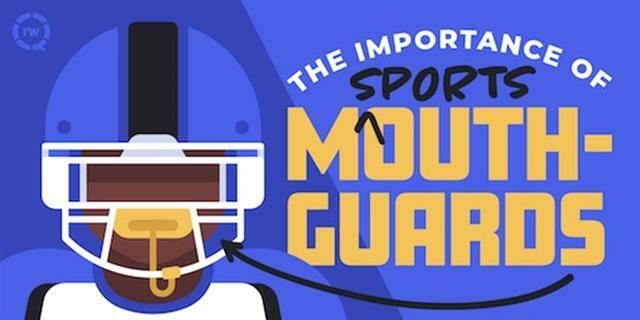 When choosing a mouthguard, it’s important to remember that custom-made guards are far superior to the "boil and bite" variety at local sporting goods stores. They are designed using a process similar to that used when making an orthodontic retainer, and guarantee a perfect fit to your child's mouth. The fit is the most important aspect of a protective mouthguard. Variations in the preparation and specifications of custom guards depend on the type of sport your child plays, as well as their age and overall dental health. On the fun side of things, guards can also be made to match your child's school colors, or can feature the logo of their favorite professional team. At first, you may find that your child objects to the idea of wearing a mouthguard, much in the same manner as when you suggested they wear a helmet while cycling. This is natural, and if you experience kick-back, it might help to show them pictures of their sports heroes wearing guards. After all, mouthguards are commonplace in professional sports, and there’s no reason your child wouldn’t want to imitate more than just their favorite player’s moves. If you’re still wondering whether investing in a mouthguard is worth it, you’ll be pleased to know that these dental appliances are rather affordable, and can even sometimes be covered by your insurance. You will also sleep better at night without the prospect of huge dental surgery bills – and knowing your child won’t going through school with a 1970’s hockey-star smile.